What you see above is what I've been working on the last couple of days - Babette squares. 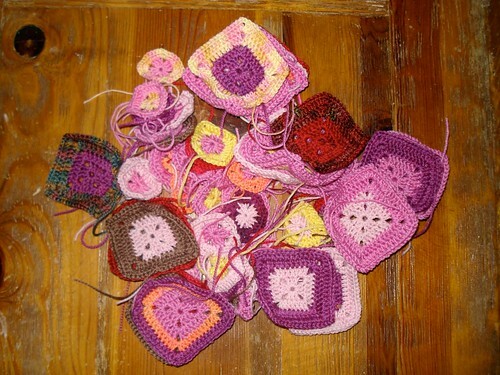 Right now, at 8:09 AM CST, I have 15 more of the smallest ones to make and then I've finished all the squares. Obviously there will be ends to weave in and then there will be the laying out and sewing together part of The Babette, but there are only 15 tiny squares to crochet! I started this project a year ago, on New Year's Eve and while I've definitely piddled around with it and ignored it for months on end, I would love to have the blocks all done by midnight tonight. I also need to let you know that I've pulled one of the socks out of the Knit Something a Month Club and added an additional shawl/wrap type thing. The new addition will be January's project, so you'll see it next week. I'll be doing shawls in January and February, but then socks in March and they'll alternate for the rest of the year, ending with a shawl in December. Caleb put them in order for me and the project bags are numbered so I'm all ready to go. Logan wants to share with everyone that he learned how the "Outside" bell works in 3 days. We finally found a bell for the back door (it's between the kitchen/breakfast area and family room so just sitting by the back door doesn't really tell us much - it's too high traffic right there), so we started ringing it every time we took him out and when we ring it, we say, "Outside." After the second day, Logan learned how to ring it, but he was only ringing it after I rang it, while I was getting on a jacket and Crocs to take him out. Then one day, he woke up from a nap, stretched and went to the door and rang the bell, then sat down by it. He only rings the bell if he needs to go outside and I'm sitting down, but he seems to understand when to ring the bell and hasn't given us any false alarms just to go out and play. He's a very smart little guy! I hope you all have a wonderful New Year's Eve and a fabulous 2011! See you next year (I've got some squares to crochet)! I've finished up my second Mohair Bias Loop! Yesterday I realized that Caleb was playing happily upstairs, Logan had just gone potty (outside) and had passed out in the kneehole of my kitchen workspace, and we had almost two hours before lunch time. I grabbed the Mohair Bias Loop, knit the last couple of rows (I had measured it the other night and knew I was only one inch short) and started grafting. It took about an hour, but everyone stayed happily playing and asleep and I got it finished without interruption. 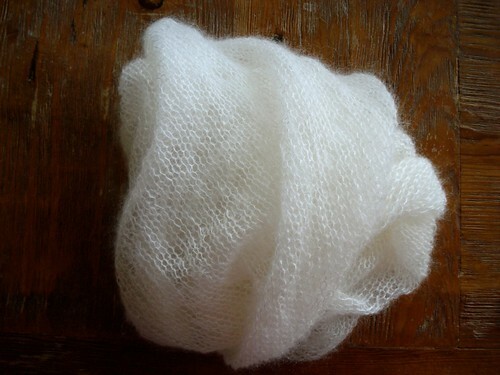 The pattern is the Mohair Bias Loop and I used Elann's Silken Kydd in Winter White (it's currently out of stock, they only have the Cloud White right now). 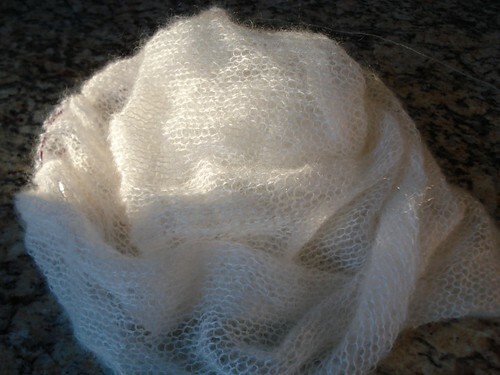 I used all of one ball of yarn and a little of the second ball. I knit it exactly as the pattern is written. Great portable pattern and it would make a nice gift (I gave the first Mohair Bias Loop to my Mother in Law for her birthday and she seemed to like it). I love this sweater and really enjoyed making it. The yarn was just wonderful to work with and I think it will be just as wonderful to wear! 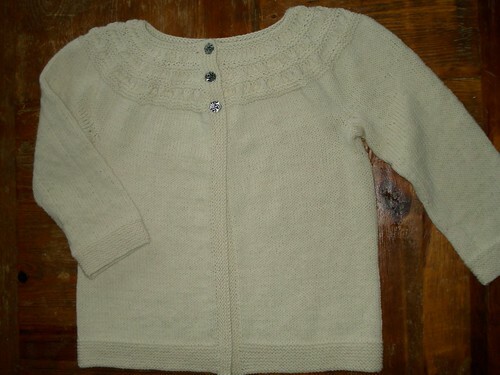 The pattern is Tea Leaves Cardigan by Melissa LeBarre for Madelinetosh yarns. 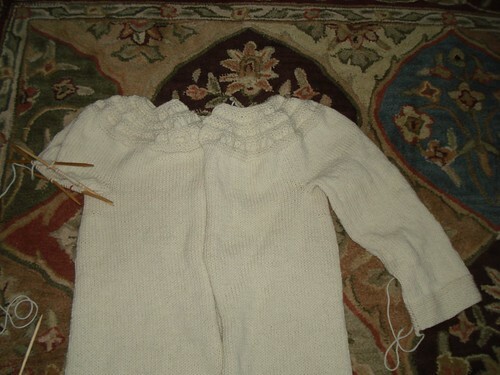 I used Berocco Ultra Alpaca in Winter White to knit it. The pattern calls for two buttons, but I had three buttons from Annie Adams, so I used all three and I like the way it looks. (I used the Nova buttons and they're 3/4 inch across. I think this is what she calls the small size.) 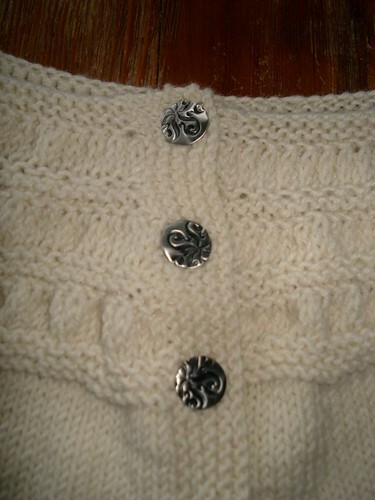 The design is simple, and in the creamy, white yarn, it definitely works with a fancy button. This will be my final finished cardigan for 2010 but I'm trying to finish up a couple of other things also before the year ends! 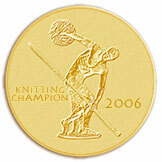 I just got this in an email and had to share. Merry Christmas again! I hope you and your families have a wonderful Christmas and are blessed throughout the New Year! I'm not going to go through each skein and tell you all the details right now, but I promise I'll share each month when I start working on it. I will continue working on other things throughout the year as well as this club and I plan to get back to writing more patterns next year, but I thought it would be fun to show all of the yarns in one place. 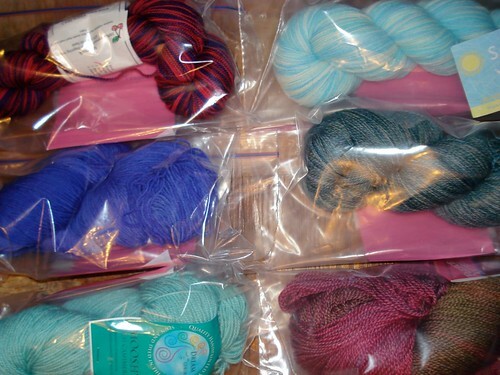 If I do take out one of the sock yarns and add another shawl, I'll let you know before next year. I've finished the first sleeve of my White Tea cardi! I'm now working on the second one, but the second one always seems to go faster (at least to me) because I know how many rounds I'll be working. 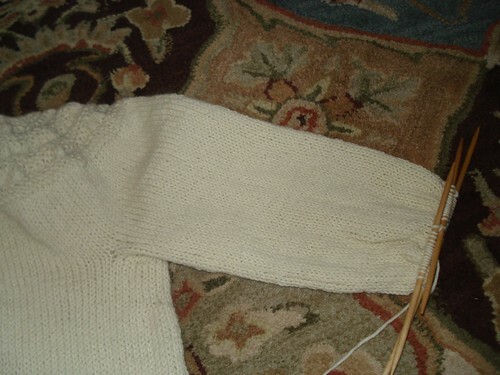 I know what rounds get decreases, I know when to start the decreases and I know when to start the sleeve edging. On the first sleeve I'm constantly stopping and measuring to figure out where all this happens. Of course first, I have to find the tape measure, which I have to carefully hide after each use so it doesn't get swiped by certain people with soft, silky ears. The second sleeve is smooth sailing. Speaking of smooth sailing, when I saw the sky this morning, I was glad I wasn't a sailor - it was really RED! We all woke up last night and went outside to see the Lunar Eclipse. There were a few clouds over the moon when we first got outside, but they blew out of the way and we got to see it. I don't remember if I've ever seen a Lunar Eclipse before but it was pretty interesting. This morning when Logan and I went outside first thing, the moon was hanging full and bright in the sky as if to say, "I'm back!" Then we turned towards the sunrise and saw all the red in the sky. It was a beautiful sunrise, but I always think of the old seafaring saying* when I see a red sunrise. I got some work done on the Mohair Bias Loop last night when we sat down and watched Despicable Me. 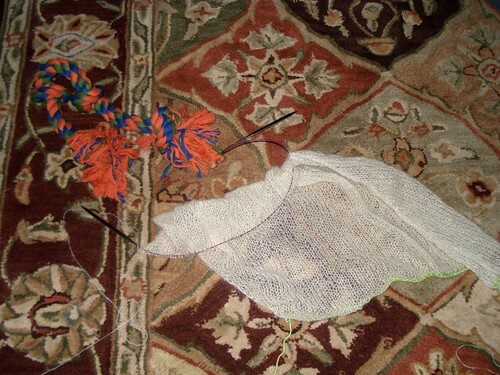 I am almost through with the first skein of yarn and I'm 3/4 of the way through the project. 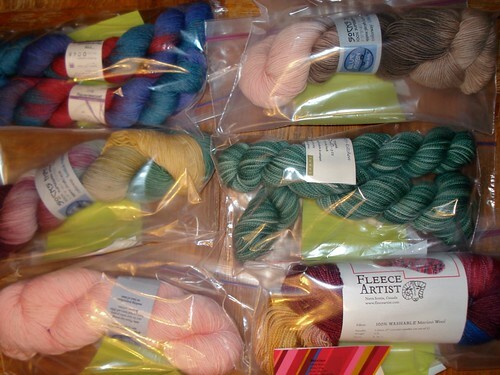 I will definitely use part of the second skein, but I'll also have some left over. This weekend Logan discovered his cow's hoof chew toys. His breeder had recommended that we pick up a couple of them for him to chew on and she even sent one with him in his crate (they don't shatter and while they're apparently great to chew on, they don't break apart either). He hadn't done anything with them since he got here, but this weekend he dug them out of the toy basket and started chewing. He says they're great. We think they smell funny, but we're not teething. Yesterday when I was in Flickr getting the photo for the blog post, I noticed something. Do you see it? Apparently, I'm dreaming of a White Christmas! (Creamy, Winter White, not fresh snow white.) I've never had this much non-color around at once before. I'm still plodding along at a snails pace on the first sleeve of Tea Leaves. Last night I got about 2 inches done on it. It's no fault of the sweater that this sleeve is taking so long, it's just that knitting isn't happening very quickly around here for a certain floppy eared reason. Logan really appreciates all the comments on his first blog post. We have gotten past his crate anxiety and he's doing great with that again and our next big job will be to work on riding in the car. I'm going to treat the drooling like an anxiety issue and see if we can train him to relax in the car. If that doesn't work, then we'll talk to the vet about motion sickness options. The reason I'm not sure if it's true motion sickness is that while excessive drooling in a car is a symptom of motion sickness, he was having excessive drooling in his crate (which was not in motion). The crate issue (and possibly the car issue) was due to stress from his Big Day of Travel. 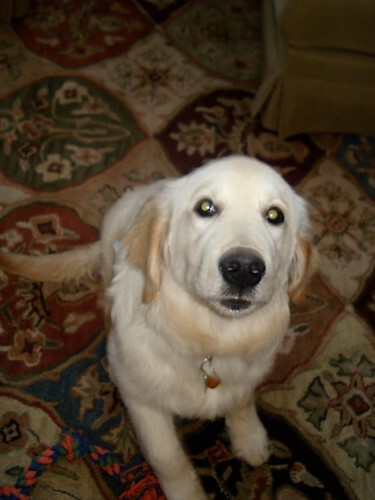 By re-training him on the crate and a little bit of time and practice, he is no longer drooling in the crate. It's a big change to come home to a dry dog versus having to clean him up every time we came home. So we'll work on the car the same way. First there will be treats in the car by the door. Then there will be treats when he climbs in the car. Then I'll get in the front seat and there will be treats. We'll progress to just starting the car, starting the car and backing out of the garage, going around the block and eventually (hopefully) we can go a little bit farther each time. We're going to work very slowly and take our time, but we'll be starting this today. Hopefully since he's really smart and he trusts us, we'll be able to figure out pretty quickly if his car issues are just stress or true motion sickness. We've always gone on road trips with our pets (Ramius was the BEST car cat ever! ), and while our families are much closer now, we want to make sure Logan is comfortable in the car for everyone's safety. Is there anyone there? I can't smell you. Oh, Mommy says that's OK that you can't smell people through the Internets. When Mommy told me I could blog, I got very excited. She told me she needed a picture of me and I had to do that sit thing. I'm very good at that sit thing, but sometimes it's hard to keep still. Especially with Mommy having the silver flashy box in her hand. I would like to hold it in my mouth. I wouldn't chew it or anything like that, I would just hold it for Mommy. Yesterday I had to ride in the car. I don't like riding in the car, it makes me drool. But then we went to the place where they give you cookies! Everyone comes out from behind a big desk and wuzzles your ears and tells you what a pretty boy you are and they look at your feet and really everyone likes my feet. Then you have to stand on this big metal thing and it tells you how much you've grown. I am now 41 pounds (whatever a pounds is) and two weeks ago I was 36 pounds. That must be good because after I got off the metal thing everyone told me what a good boy I was again. I must really be a good boy. Then the lady who gives me cookies comes in and she pokes me in rude places, so it's a good thing she can reach the doggy cookies. I won't even tell you where she took my temperature! But in between being rude and giving me cookies, she checked my ears and they're all better. Then Mommy and I had to get back in the car, did I mention that I am not a fan of the car? Mommy even tried putting cookies in the car, but I wasn't fooled. That car is up to no good. When we got home I had a nice nap. I know Mommy puts pictures of her yummy yarn stuff on this Internets place, but I don't know if she told you how much I help. I like to curl up next to her and make sure the yummy yarn is arranged right. I don't think she could do it without me, so really I'm a big part of making the yummy yarn stuff. I'm going to go take a nap now. I like a morning nap after Daddy and Caleb go off wherever they go and the house gets quiet. Goodnight! 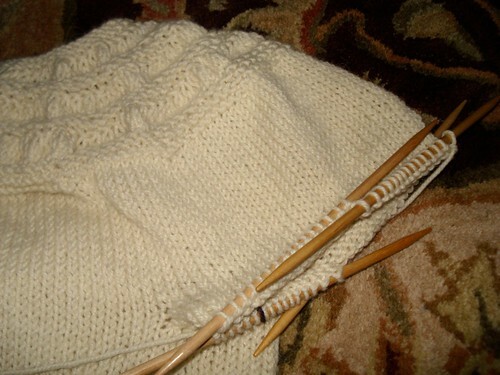 I'm moving along on the sleeve to my White Tea cardi. If by moving along, you understand that I knit a little bit, then take Logan outside, knit a little bit, go find Logan who's attempting to wander off and explore*, knit a bit, wipe the puppy spit off the double points. Yep, moving right along! Something I can see progress in is Logan's growth. I'm pretty sure he's gotten bigger in the 2-1/2 weeks he's been part of our family. He's going to get his ears checked tomorrow (he had a little ear infection, so we're just making sure things are cleared up) and we'll get him on the scale then, so I'll know for sure how much bigger he is. *Exploration, when supervised is fine. Unsupervised exploration is not a good idea for a puppy. 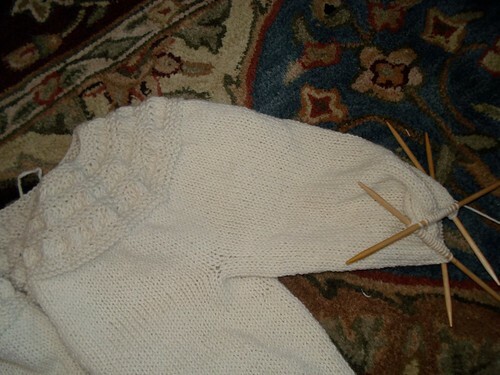 I don't have any pictures because I was working on Christmas knitting yesterday. I should be able to finish the biggest project and then I'll fit the rest of it in around my normal knitting, so at this point, I'm planning on returning to normal blogging next week! With pictures and everything! I've discovered something new about Logan. We were going for a walk the other day (we do little walks so he can learn how to behave on a leash and get a little exercise) and he found a stick. It was a little stick, about 10 inches long, really more of a twig than a bigger stick, but he picked it up. And proceeded to carry it for the rest of the walk. No chewing on it, just carried it happily and pranced a bit (retrievers are always so proud of themselves for carrying things). He was really funny, but having the stick in his mouth meant he wasn't picking up rocks/mulch chips/acorns and I didn't have to fish rocks/mulch chips/acorns out of his mouth as we walked. I've seen dogs who like to walk with toys in their mouth, but I've never had a dog who did this. Apparently now I do! I'm thinking of getting him a retrieving dummy to carry on walks because there aren't always sticks available. He could bring the dummy inside and we could use it just for walks, and I would know where the dummy had been (you don't always know what sticks have been up to or who has been on them). I'll have to take a camera with me on our walks so you can see him! I meant to blog yesterday but didn't take into account the time involved with blogging versus the time available to get cleaned up and get to my haircut appointment. Uncaffeinated mornings are like that - the time/space continuum fits my schedule, regardless of reality. So I'll just blog this morning. I've been getting work done on the Mohair Bias Loop. I haven't measured it lately, but I do think I'm past the halfway point and I'm finishing up with the first ball of yarn (using the Kid Silk Haze comparable, but better priced, Elann Silken Kydd). You can see how sheer this is by the pattern on the rug showing through. There's just not a lot to say about this pattern other than it's perfectly simple and portable and the finished object is very versatile in the way it's worn. 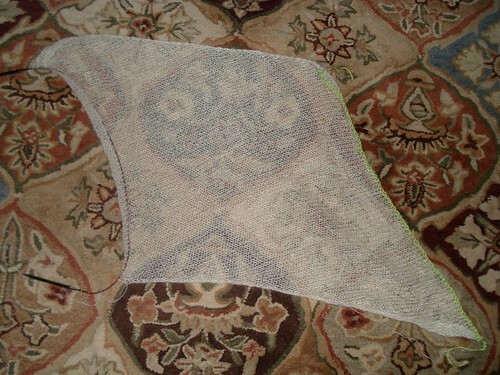 It's hard to describe the knitting pleasure I get out of knitting with fluffy, light-as-air yarn on huge needles and creating this ethereal rectangle. I still think these would make great gifts, but one of these would also be a great post-Christmas knitting project for the knitter whose brain is fried from last minute Christmas knitting and who can barely remember their own name. All I have to show on the blog today is a little bit more of the first sleeve of White Tea. Not impressive, I know. What I can't show is how much I got done on the biggest Christmas knitting project (hoping to be finished by this week), and how much Logan learned this weekend. Logan had developed some anxiety over being in his crate (probably flight related stress) and we were having some issues as a result of this. Logan had been crate trained at the kennel he came from and he has to be in the crate when we leave the house. (Of course, part of crate training means they go into the crate sometimes while you're home also, so they don't associate the crate with you leaving.) His anxiety was making it very difficult to leave him alone. After crate training Finn (Bear, who came before Finn didn't get crate trained because we didn't know anything about it - he just ate the house), we realized how great crate training could be because it's safer for the dog and the house! Logan HAS to go into his crate when we leave. There's just no negotiating that. So he and I and a bag of treats started working on the crate or "Happy Place" as we call it. We worked slowly but kept building and by last night we had made major progress from where we were Saturday morning. Since he has been comfortable in the crate in the past, I'm sure things went faster than they would have if he was meeting the crate for the first time, but he really seems to catch on to things quickly. Of course treats and happy cuddles don't hurt either! Oh, and just in case you were wondering why I got so little done on the sleeve last night? 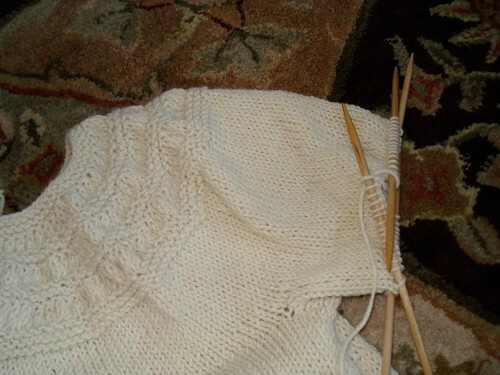 Well here's a picture of what knitting looked like. (He's leaning on my leg.) You can only knit for so long before you have to rub the sweet puppy belly! Since certain people are WAY too interested in what I'm knitting (it would be flattering if it didn't hold so many potential dangers to the knits), pictures of what I'm knitting must be done very carefully. This was taken this morning as the above mentioned "interested" party ate his breakfast in his crate. This, of course is the Mohair Bias Loop that has been growing very slowly. Since it's laceweight yarn, and it blows in the slightest breeze like a mohair spider web, it's very distracting. By distracting, I mean it makes you want to catch it in your mouth and hold it there and taste it, possibly acting as a canine tensioning device as the yarn trails through your mouth on the way to your Mom's hands, who can then knit with wet yarn. Hence the growing slowly. When he wasn't helping with knitting yesterday, Logan figured out how to open the closet door and proceeded to bring out lace scarves and mitts. I'm sure it was quite helpful in some way or other. This morning he's trying out some home defense - he can see the neighbor's Great Dane through the fence and he's barking very bravely at him, from inside our house. 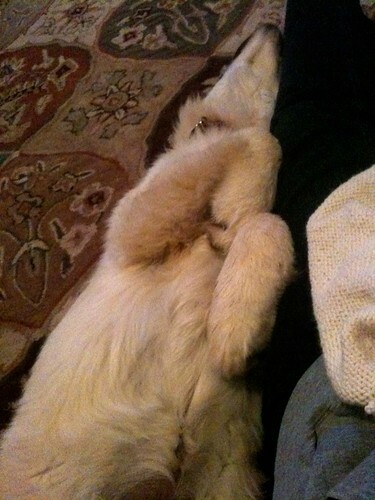 He's definitely settled in and being a puppy!